The mobile devices markets are booming as more and more people are switching to smartphones and start using tablets in their everyday life, but what has happened with 3D smartphones and 3D tablets? If the mobile devices market is growing a lot constantly and quite fast why we are not also seeing new mobile devices with stereoscopic 3D capabilities. A good question indeed, it is not that some companies haven’t tried introducing 3D-capable mobile devices, it was probably a bit early for them in terms of technological capabilities, but that does not mean we should not be getting new products available as the technology advances. So why it is not happening when we are seeing announcements of newer and faster mobile processors and mobile graphics with more and more cores, higher resolution displays and better cameras all the time? In 2011 LG introduced their first 3D-capable smartphone LG Optimus 3D P920 (also known as LG Thrill 4G in some markets) and HTC did a similar thing with their HTC EVO 3D smartphone with both devices featuring autostereoscopic 3D displays (glasses-free), dual cameras for 3D photo and video capture and 3D output over HDMI to an external 3D-capable display. LG even introduced at a bit later time a software to render normal non-stereo 3D Android-based games into stereoscopic 3D ones (apparently powered by DDD’s TriDef 3D software for mobile devices). The next year LG announced another 3D-capable smartphone called c P720 as a successor for the Optimus 3D device, though it was not that much improved over the older model and after that they stopped with 3D support. These three smartphones are pretty much the only globally available mobile devices of this type with stereoscopic 3D capabilities, though there are some other 3D-capable smartphones being released only in certain countries such as Japan, South Korea, China or India. On the 3D tablet market there is pretty much only one name – Gadmei, a Chinese company that became very popular thanks to their affordable 3D tablet with an autostereoscopic 3D display in 2011 and 2012. Being one of the first and offering affordable device it has quickly become widespread, and now there are even a few very similar models available with 3D capabilities from Gadmei. Not to mention that the company has also made OEM versions with different brand names. The problem with these devices is that their glasses-free 3D displays are not that good offering limited number of viewing points and the resolution of the displays isn’t that high especially for 3D use. Furthermore no 3D cameras and ability to play games in stereoscopic 3D mode, so they were mostly good for previewing 3D photos or watching 3D movies. This year the NEO3D tablet became a reality after a successful crowdfunding campaign, though this is essentially rebranded Gadmei 3D tablet that comes with a few extras intended for the American market even though they ship it worldwide. And while the NEO3D tablet is more appealing for the North American customers due to the local warranty and support along with some extras such as TriDef 3D mobile application for transforming Android games in stereo 3D mode the overall 3D experience is pretty much the same. In 2011 LG also tried to go on the 3D tablet market, but with a half finished product and by half finished I mean a device that had for example a dual cameras for 3D capture, but was not equipped with an autostereoscopic 3D-capable display and instead supported anaglyph 3D mode so you had to use red-cyan 3D glasses. And the worst thing you could do with a 3D capable smartphone or tablet is to want the user to use 3D glasses in order to be able take advantage of the 3D capabilities of his device. Another interesting thing in terms of 3D support on tablets is what Nvidia did with the release of their Tegra 3 chipset – porting their 3D Vision technology to tablets powered by Tegra 3 and thus alowing some games to be rendered in stereoscopic 3D mode. The catch here was that there was no tablets with Tegra 3 released with an autostereoscopic 3D display, but you could connect the tablet to a 3D-capable 3D HDTV or a 3D monitor with HDMI 1.4 3D support and play the game on the larger display in 3D. Unfortunately not all Tagra 3 powered tablets supported that feature and other devices such the Ouya game console or the Wikipad gaming tablet (powered by Tegra 3) did not come with 3D support as well. And with the announcement of the newer Tegra 4 that mostly improves the graphical performance over the previous generation Nvidia hasn’t even talked about stereo 3D support and the first devices such as the Project SHIELD or the first Tegra 4-powered tablets are apparently not going to even support external stereo 3D output. And in the last year or so not only the stereo 3D supporting games for Android ad Tegra did not increase, but actually they have decreased to 14 from 16 according to Nvidia’s Tegra Zone website. 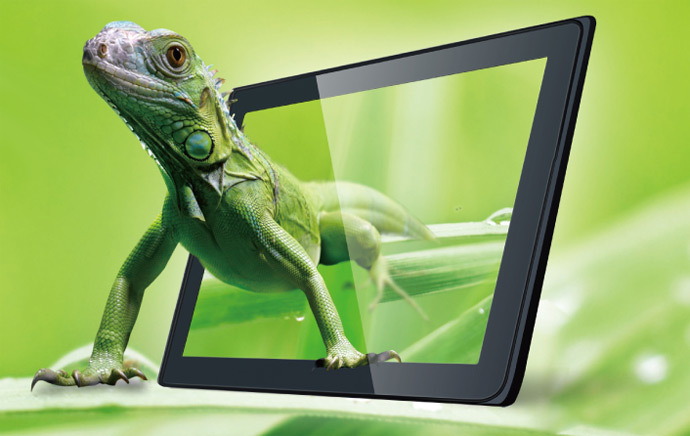 So what do we need to have a successful 3D-capable tablet or a smartphone? First a good autostereoscopic 3D display that will allow the user not to loose the 3D effect while moving the tablet like for example when playing a game that uses motion of the device to be controlled. Of course the glasses-free 3D display has to come with higher resolution and pixel density in order for the image in 3D to look good enough even with the reduced resolution in stereo 3D mode. Furthermore the 3D display should be useable in stereo 3D mode inn both portrait and landscape mode and not be limited to just landscape orientation because of the parallax barrier used to achieve the 3D effect. Well, you can say that we have pretty much covered all of these already which reminds me for example of MasterImage 3D’s Cell-Matrix Parallax Barrier technology that looked great when it was announced and though already quite some time has passed it still is nowhere to be found. Or at least almost nowhere to be found with just one 3D-capable smartphone using it that got released only on the market in India earlier this year – the Micromax Canvas 3D A115 smartphone with 5.0-inch display with just 480×800 resolution and that is far from great for stereoscopic 3D use if you ask me. Looking around for new and interesting mobile devices that are supposed to be available this year on the market one device caught my attention – the Hampoo 3D tablet that is supposed to be on the market by the end of this year. Hampoo is another Chinese manufacturer that is making a 10.1-inch tablet with 1920×1200 resolution autostereoscopic 3D display and more up to date specifications compared to the hardware you can find in the Gadmei 3D tablets. Apparently the company is already shipping volume orders of their Hampoo 3D tablet, but I’m still unable to find the device anywhere available for sale to end users. In the end the things on the mobile 3D-capable devices market seem even worse that what is currently happening on the PC market in terms of solutions for stereoscopic 3D including, but not limited to gaming. And the 3D content available for mobile 3D-capable devices is even more problematic than that available for 3D-capable computers, and that is just another problem ahead of the 3D-capable smartphones and 3D tablets. Unlike with computers, where you can do with a 3D display that requires the viewer to wear glasses in order to be able to see the 3D effect, with mobile devices that is not an option so an autostereoscopic 3D display ad a good one at that is a must have feature. And while the glasses-free 3D displays need some improvement and thus the technology sill needs to catch up, we are also seeing a lot of alternatives in the form of various adapters that will turn your non-3D smartphone into a 3D-capable device. Most recent and interesting of which are the EyeFly 3D and the vrAse, both of which are looking very promising and you might want to keep an eye on and try them if able to and have a compatible device. Have in mind that vrAse is still not released and is still an ongoing project on Kickstarter even though their goal for funding has been reached already, you can still support the project and get a unit earlier. Never heard of Hampoo, looks nice but I wonder why no stereo camera on the back… and not sure we’ll see it in North America. LG’s 3D phone was really bad – for example, it would receive a call and start ringing, but wouldn’t respond to any touches or key presses to accept or reject the call. 3D was impressive though. Just wanted to point out that there is a 3D “hand viewer” already on the market that lets you view 3D images and movies on your HD smartphone, it’s the ViewVaster HD3D from Cyclopital3D! We also make a larger “desktop” unit that uses an iPad as the display. Incidentally, ViewVaster HD3D recently received a “New Product Award Recognizing Outstanding Achievement” from the International 3D & Advanced Imaging Society, which we are very proud of. And it also misses dual lenses on the back. I now know of 3 stereo tablets (including NEO3DO), not a single one to capture 3D on the go. You did not mention the most successful mobile 3D device, the Nintendo 3DS, it has a healthy content library and is still prominent in the development of Nintendo products. Gaming is probably our best option for adoption of 3D. Glad Ken from Cyclopital was able to point to the Viewvaster one of the many brilliant S3D products they/he produce. I am in awe of his quiet genius. The LG P920 3D phone is a fantastic unit , I dread the day I have to ditch it. The Gadmei (insert rebrand badge name here) is just a 3D player with a very narrow sweet spot but it does works well and a great mobile MPO viewer. Gadmei have given the world the first glasses free tablet (NOT neo3d) and deserve more credit for their investment and effort. At $199 a 720p tablet that can playback in 3D is pretty damn unbeatable value. And it’s for sale in a few places, but at stupid prices. It’s apparently not officially on sale yet so these are early sales that seem to be testing the market for how much they can get away charging. The prices is supposed to come down when it officially launches later this year. I had the inferno, which was based off of the Gadmei design. I loved the 3D on it, but I always felt like it was a design flaw that it didn’t come with a stereoscopic camera, or that there was no 2d/3d button on the bezel. I bring that up because in many apps, it depends on the app to have a built in 2d/3d button to convert..but if the app doesn’t have it, you are out of luck.